CYCLINGFORUM.COM -- View topic - Work Stand? 8/25/18 12:58 PM Work Stand? Any recommendations for an inexpensive work stand for simple, basic maintenance? Affordable? Maybe not. But these are really good and fold up fairly compactly for storage. I have an older version and have been very pleased with it. But they are over $300. "If it's worth having, it's worth paying for." I have been using the same consumer Parks stand since the 90s. It has never failed me. And as many here for the decades know, I have built and rebuilt dozens of bikes over the decades, All have been wrenched on this stand, same as pictured. Was like $125.00 originally. I thought it would be temporary until I got something better, but it is less wonky in use then it looks like it might be. I have always used bubble envelopes from the P.O. to pad out the jaw to provide extra protection. I used to sandbag the legs early on, but realized once a bike is in it that the weight on the bottom/legs really is not needed. Just fold it up and hang it when done so you don't topple it into a bike and dent it. ;) With no bike in it, it will fall over if you bump into it. The current version PCS-9 here on eBay with free shipping for about that same price I paid years back. If you have a sturdy bench, the bench mount is reasonable IMO. +1 feedback sports. I use the non-pro (black) model which is a little bit less $ than the pro (red) model shown in the prior post. Been using it for years. What I like is the main clamp is not spring loaded, but rather you turn a handle to dial in your tension. It also swivels to accomodate various setups - whether you clamp the bike at its top tube or seat tube. The tripod makes it very stable. Aluminum construction makes it reasonably light to carry and it folds up compact. REI has them on sale now through labor day. I have the same Park PCS-1 as Sparky, but it's now my spare stand since I found a deal on a Park PCS-4 on Craigslist. I like the screw-adjustable clamp on the PCS-4 much better than the spring-loaded one on the PCS-1. I stretched several layers of inner tube over the clamp adjusting nut so I can easily spin it with just my thumb, which makes mounting a bike much easier. Sparky, I made a rear support for the PCS-1 out of PVC that snaps over the right leg and is hose-clamped in place. It extends out 6" or so and prevents the stand from falling over. I snapped a piece of the same material over the other leg so the stand doesn't wobble. Linda has a Performance Spin Doctor Pro stand that's pretty decent and it folds to a convenient-sized package for storage. The only thing I don't like about it is that it's tightened with a knob, which is slow and cumbersome when you're holding a heavy and/or awkward bike with one hand. The stands are made by Topeak and their parts and accessories are interchangeable, so I may order one of their replacement clamps with a crank handle, or make a crank myself. Thanks, all. I did not see the Feedback on sale at REI. The REI person I spoke to said that the legs of the Park PCS-9 do not fold away, which would make storage a problem for me, although the model on the Park website has a bracket that slides up, folding the legs. In any event, I may wait for REI's next 20% off offer, then decide between Feedback and Park. 50% off, 49.00 bench mount. If you have an ALDI's grocery store you can sometimes find a $30 bike repair stand there. If you Google it you'll find some pictures. 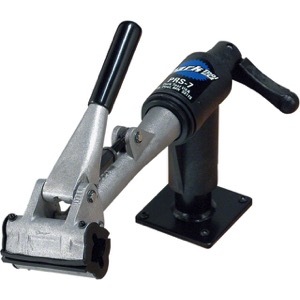 If you are expecting Park quality don't but they are great for occasional repairs and work. I've gone to "race" style workstands, as clamping on a small frame's seatpost is often an exercise in futility. Yeah, Linda's bikes have often presented interesting challenges. Fortunately, the Performance/Topeak style clamp can be rotated to grip the seat tube or post from the front or support the top tube from underneath. The clamp is also pretty short, so it doesn't need a lot of tube to grip. I made a wooden cradle for the teardrop-shaped top tube of her TT bike, which clamps in the stand. 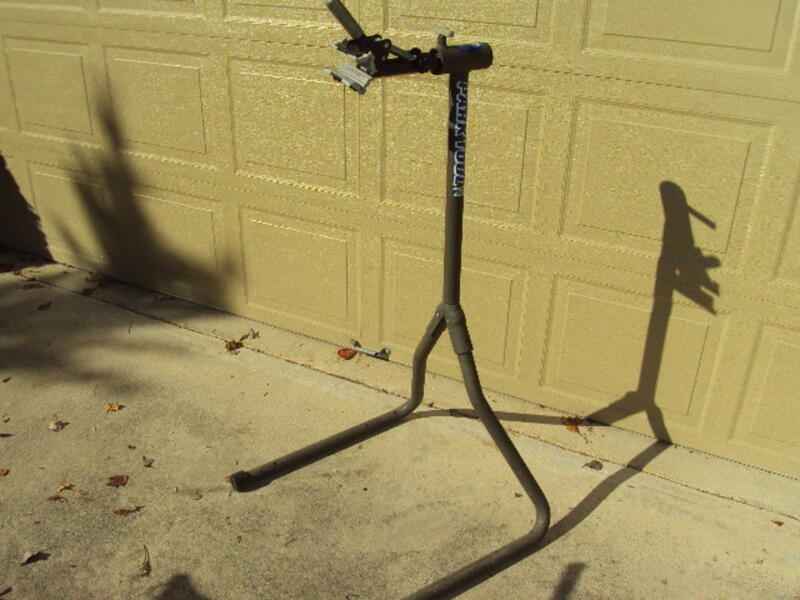 That Feedback stand looks a lot like my 15 year old stand that is still going strong, but it has a different name.